Three important Venice islands by vaporetto with a local guide. Murano Island, famous for glass-making, is the most popular island to visit. A few centuries ago, all glass makers were required to live on the island to protect the glass-making secrets. Today the tradition of glass making continues here and you can find out all about it in the glass museum. Some glass factories allow visitors or tours and there are many shops selling glass creations and souvenirs. Murano also has canals, sidewalk cafes, and restaurants. 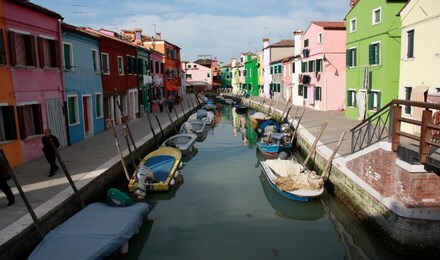 Burano Island is an island of picturesque canals lined with colorful houses. There are several good restaurants serving risotto and very fresh fish. Famous for artisan lace, you can buy lace products in many of the shops (but check to see that it's handmade and not mass-produced) or visit the Lace Museum to find out more about the tradition of lace making. San Michelle is Venice's cemetary island. On the nicely landscaped island are two churches and many tombs. A good time to visit is in early November when the cemetary is full of flowers as it's customary to take flowers to the graves on All Soul's Day. Tombs of famous ex-pats include Ezra Pound in the Protestant section and Sergei Diaghilev and Igor Stravinsky in the Orthodox section.